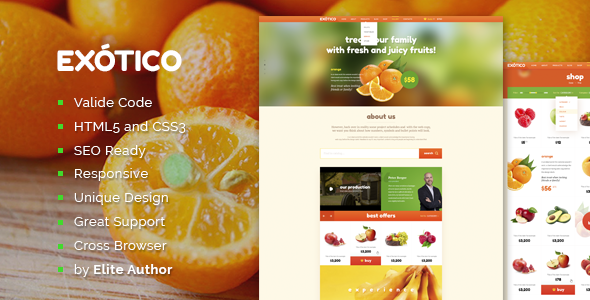 Exotico Responsive HTML Template was designed for agriculture, fruits and vegetables websites and shops. The template is the best solution for exotic shops, for agriculture portals or simply for vegetables catalog. The template comes with different page templates. The Template layout adapts to the Screen size of different device your visitors are using. You site will always look good and utilize 100% of screen estate on every device. The Exotico template is built with SEO best practices, so everything is prepared for your business, to ship thousands of visitors to your site. It works perfectly well with SEO plugins. Item Reviewed: Exotico Responsive HTML Template 9 out of 10 based on 10 ratings. 9 user reviews.